Petite Noir’s new four-part visual album, La Maison Noir (The Black House), is a story of struggle, life, death, and ultimately rebirth. The tale unfolds in the Namibian desert, a surreal visual narrative exploring Petite Noir’s identity politics of growing up in Africa, fame and “the noir wave experience”. eSports. Is it even a sport? After reading the title for our first post in over a year, some of you are probably thinking we've lost our minds... eSports is not a real sport, while others are going, duh! It is a major sport. Let's investigate. eSports is defined as professional gamers playing video games, competitively, usually in front of lots of viewers and there is usually money on the line. Professional gamers, video games, viewers and cash. Sounds simple. What makes you a professional sportsman in any regard? Well, let's look at most traditional sports. There is an organisation, the organisation has teams, the teams have coaches, vice coaches, analysts and other specialists that work together to pick professionals out of aspiring professionals and in this way they create a team. Then they all go to tournaments and compete for cash prizes, but more importantly a following and influence over enthusiastic supporters in order to sell merchandise and essentially build a fan base to monetize. A professional athlete practices to be the best so they can be a part of the process and make a living with the rest of the organisation and its stakeholders. You sign contracts with organisations whose sole purpose is being the best or at least giving others a reason to believe they are the best. How does this differ to esports? It doesn't. At this point most critical thinkers are probably wary about the legitimacy of the organisations and the process we've outlined. Riot Games is the creators of League of Legends a massive online multiplayer game. Recently they have started applying the business model used by the NBA, yeah the mighty basketball organisation. Still not enough validation, well the Houston Rockets and the Golden State Warriors along with other big names in the NBA have started creating teams and organisations. Over 100 applications were received by Riot Games of which each application cost $13 million and $8 million needs to be paid upfront. Which brings us to our next section. Dota 2 another well-known game in the esports realm is known to have a pretty big prize pool of $24,687,919,00. That's bigger than the cricket world cup and that is only one of many games. Team Liquid an esports organisation has reportedly earned $20,443,629.64 by competing in various competitions that has taken place across various games. It is safe to say that there is enough cash getting thrown around. So where does all the cash come from? Well, from the viewers. It might be hard to believe by some, but these competitions fill major stadiums globally when the championships of certain games are being held. This is on top of the smaller events held throughout the competitive season. It is also worth mentioning that websites like Twitch.tv is constantly streaming these events for viewers and tend to have thousands of people watching from the comfort of their homes. Just like television, but the online platform is growing and not dying out like television. Let's just say, the stereotypical gamer kid from high school movies and his friends are all coming together and enjoying esport much like the quarterback and the cheerleaders are enjoying the Super Bowl. The last piece of the puzzle and really the only piece that differentiates esports and traditional sports. The rules are set by algorithms, the referee is on stage making sure players are using standard equipment and different formats of play commence until a winner is announced. There are rounds, there are half-times, group stages and the likes. It's just not on a field. Players don't run, jump or swim, they sit and concentrate for hours honing their knowledge gained from experience using communication skills and reflexes to be better than the competition. This is the moment some would say esports lack athletic ability and therefore is not a sport. An argument that can go on forever. It all comes down to what you personally believe to be athletic ability. What we'd say is that if esports lacks athleticism then chances are you don't think chess, poker, sharp shooting, darts, archery or oil wrestling is a sport either. (Okay maybe not the last one.) However, we can assure you that these gamers have boot camps, training sessions, scrimmagess and pretty much everything a more "athletic" athlete would have. Their skills are just based on different aspects that don't necessarily involve pure strength or stamina. Is esports vs traditional sports the equivalent of email vs snail mail? 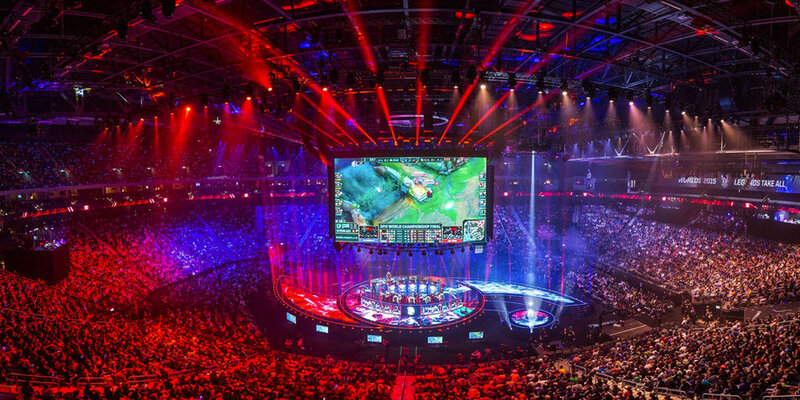 Probably not, but the real question we are asking is: is esports even a sport? We'll let you decide. What we can say is that more people are getting involved and at the end of a long day some of us at Iconic would rather watch people play video games than spend time watching people run around with a ball. Not all of us, but there are a few. Heavy Metal: We Got Our Bird! The Loeries Awards: we were just happy to be there, but we actually walked away with a Bronze Award! Mobile Ads Need an Update. Programmatic Native could be the answer. Red Bull Wings for Life Ambassador Dries Millard's initiative, Adaptive Surfing South Africa, is making history. The Making of Red Bull's "Conquer the Cape" ft Mad Mike Whiddett! Iconic's video team captures scale and effort of the making of Red Bull's "Conquer the Cape" with Mad Mike Whiddett, learns about tyres and missing rings. We have desks available for creative cool cats. Not quite a still-life with grapes. More like many sequenced still-life images stitched together to form the magic that is video, with grapes. It is now possible to achieve many things with great insights. Use your powers wisely, Spider-Man. Flaunting bloated metrics around is that kid in the snow-ball fight pelting everyone with yellow snow. You're reading Iconic's "blog". The best way to describe this place is to say that there is a proverbial finger on a proverbial pulse... but we're not going to to tell you which finger, or which pulse.